New iPhones! Search news? Oh right… So… About that search news. Panda’s making U-turns, Yandex penalizing sites for selling links, Bing offering new keyword tools and more! 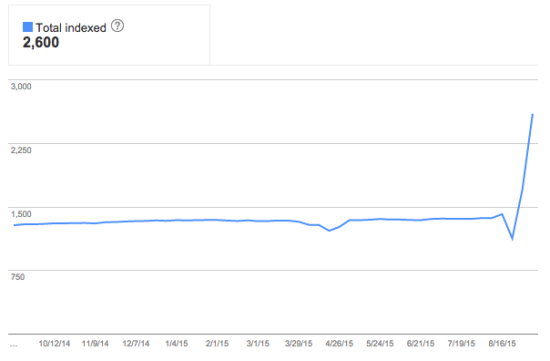 Google announced a Panda 4.2 update that’d “very slowly” roll out a while back, we covered that. It seems as though, according to this post by Barry Schwartz at SearchEngineLand, the update has been reversed. It could be that Google’s continuous user testing started giving lower ratings for their search results, indicating that Panda 4.2 was, in fact, not an improvement. Google didn’t comment, but it seems a plausible hypothesis. Looking at some sites myself in SearchMetrics, I definitely see… Weird behavior, visibility going up and coming down again, which could support this hypothesis. Yandex has announced that they’ve penalized a bunch of sites for selling links. I’ll spare you a link to the Russian blog post (oops you got it anyway) and give you a link to SearchEngineLand instead. It makes a ton of sense to make these kinds of adjustments, but it’s funny to see them come out of Yandex, who actually announced with some fanfare at the end of 2013 that they would stop using links (for certain commercial queries). I think it shows how important links are to ranking algorithms and how hard they are to replace. So much that it’s worth cleaning up the signal by making adjustments like this. We write a lot about keyword research, as it is, truly, the basis of SEO. So when new tools arrive that help you do keyword research, I always get excited. Even more so when created by Bing as, historically, even though Bing drives far less search traffic, their keyword research tools have always been among the best in the business. Bing announced a new keyword planner on Wednesday, available in your Bing Ads account. It’s worth creating a Bing Ads account just for that. There are historical statistics in there, suggestions for more keywords etc. etc. Of course, the best tool in doing keyword research is still your brain, but tools like these can help you get new ideas. Turns out that Google had a bug (the dip) and then changed how they calculate this number (the spike). There’s an “explanation” by Google here, but it doesn’t make sense, they just changed it. I’m hoping it’ll stay stable at the “new normal”, as that ways it’s the most reliable. This post first appeared as Weekly SEO Recap: Panda U-Turns, Yandex penalizes and Bing launches new tools on Yoast. Whoopity Doo!